SKU: KSLSZ362C-STS. Categories: Fridge & Freezers, Chest Freezers. 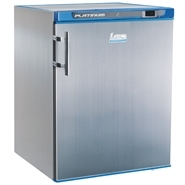 Vestfrost SZ362C-STS chest freezer with stainless steel lid is another top seller from the Danish brand of unbeatable economy commercial chest freezers. 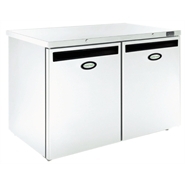 You can rely on this spacious 13.2 cu.ft/362 litres capacity chest freezer to accommodate all your business needs. This chest freezer has laminated counter balanced stainless steel lid making it robust and the contents easily accessible. The stainless steel lid is handy as it offers the convenience of using as a work top for food preparation. The surface is hygienic and can be effortlessly wiped cleaned. 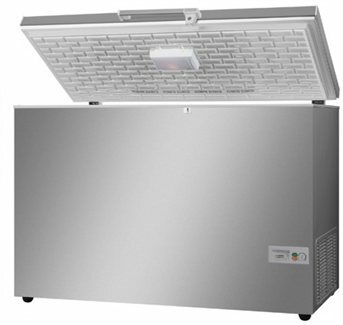 The stainless steel top option is available for the vestfrost SZ362C-STS and vestfrost SZ464C-STS chest freezers. The robust cabinet is made from durable galvanised pre-painted steel in silver exterior finish. The interior being made of laminated galvanised aluminium adds extra strength and durabilty. A lock is provided on the handle for secure storage of products. 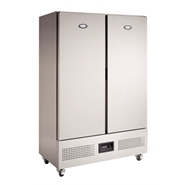 Vestfrost SZ362C-STS chest freezer comes with energy efficient 50mm insulation reducing energy bill by lowering running cost. This chest freezer features an easy to maintain energy efficient skin condenser that requires no cleaning. The chest freezer is designed to maintain correct temperature whilst able to withstand being frequently opened each day. It has a temperature range of -17.c to 24.c. It also features an adjustable thermostat and an external thermometer for easy monitoring and altering of temperature allowing foods to maintain the correct temperature. An internal light is fitted for good visibility. 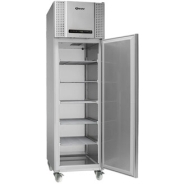 The vestfrost SZ362C-STS chest freezer features spacious stackable baskest that allows for easy access and organised storage of foods such as ice-cream and other frozen foods. The chest freezer comes with super-freeze function so that freshness of food is maintained. It comes with a defrost water drain hole and defrost water tray. 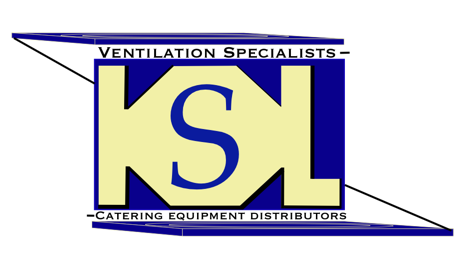 Vestfrost SZ362C-STS chest freezer comes with an incredible 5 years manufacturer’s parts and labour warranty. It is environmentally friendly – 100 percent recyclable.